Sometimes I get stuck on a tiny little detail. I can’t find the solution and all my grand plans grind to a halt as I hit the same buttons over and over again, hoping that it was just a fluke that it didn’t work the first ten times. Mr. Einstein would not approve. So the first time I tried to install the Eprint bookmarklet I failed miserably. Why? Because, despite the totally arcane instructions (see below) I couldn’t figure out how to move my cursor in the URL field. So Kept on tapping the URL wanting to scroll and it wouldn’t. It finally took me accidentally holding my finger down long enough for the magnifying glass to show up, and then moving my finger in shock at its sudden appearance to realise this is how you move your cursor in Safari on the ipad. 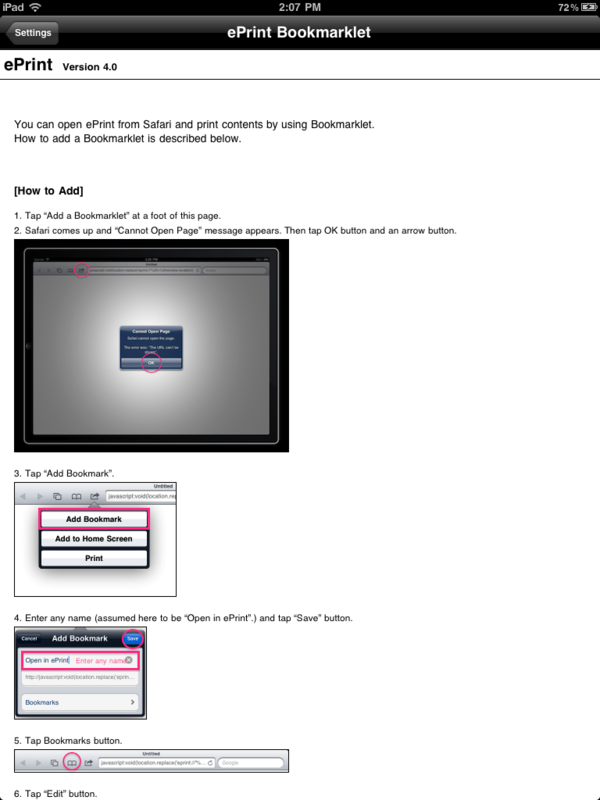 Here are the directions for the bookmarklet. If you go into Eprint, click on settings, then scroll to the bottom. You should find them there. I did have to write them down however as when you begin the process in Safari, it doesn’t allow you to switch screens for a moment to check them. Once I figured out how to move the cursor so that I could remove the Http:// in the URL it was very easy. And now I can easily print pages of the web! (this is helpful if you are using the SIS system on the web and want to print out a class list, or if you have accessed a google doc or a map or a recipe or….well, the possibilities are endless. So first proof of insanity. Am I cured yet? Second proof: installing Evernote on my desktop. I know, I know. This is an ipad blog. but one of the mysteries of Evernote, which everybody seems to speak highly of, and of which I find clunky and non-intuitive, is that you can’t actually tag anything on the ipad. 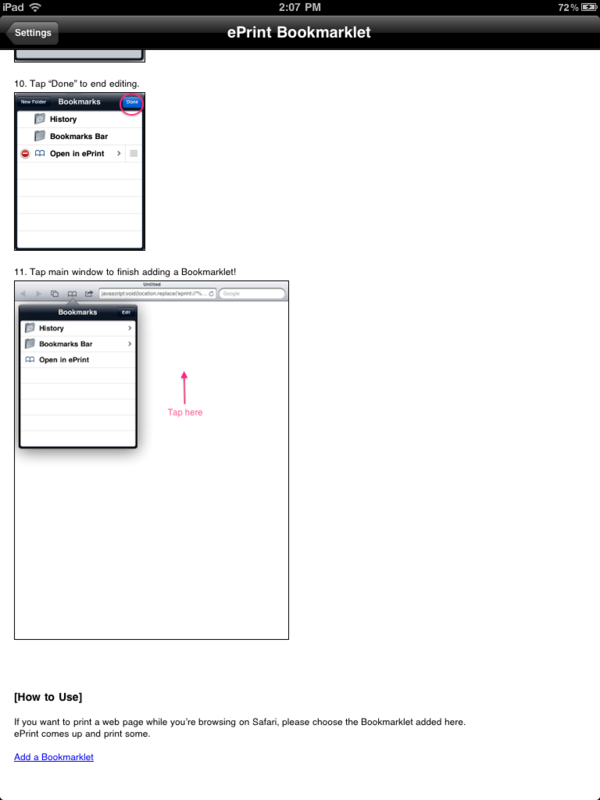 You can VIEW stuff, but you can’t save it on Evernote. I find this ridiculous. They should really have an Evernote. 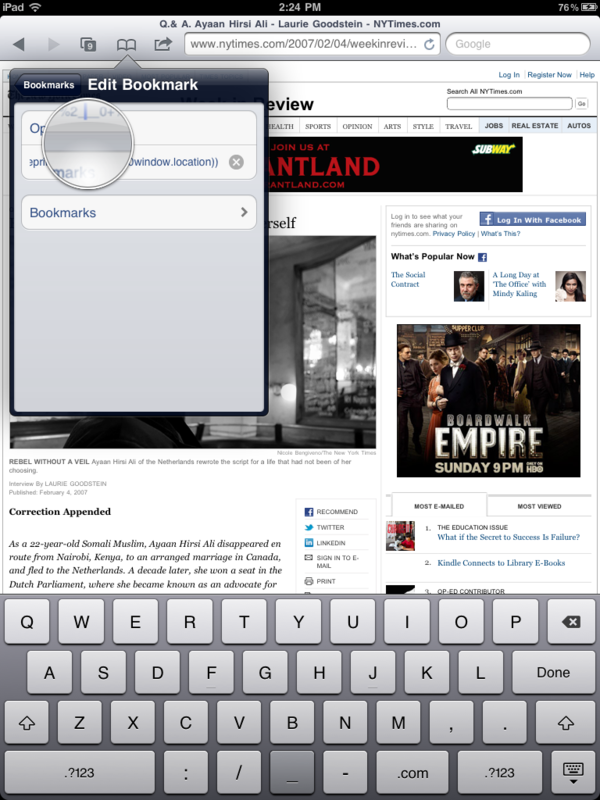 bookmarklet. Maybe they do and I haven’t looked hard enough? But I digress. I wanted to tag some of the articles i have been receiving via my Google Alert for the keywords “Ipads in schools” and “Ipads in education” and share them with you (which I will still do, I promise.) But I couldn’t find the little Evernote elephant icon in my browser’s toolbar. So I downloaded it from the website, restarted Firefox and still no icon. So I did it again. And again. Until I was about to start lobbing things at my computer. I finally gave up and did something else. It wasn’t until I began this blog post did I finally spy the elephant. And no, it wasn’t on my browser’s toolbar but on my desktop toolbar! I kind of hate Evernote more now. If you are having better luck with this app, please let me know. So far, as you can probably read, I’m not loving it. 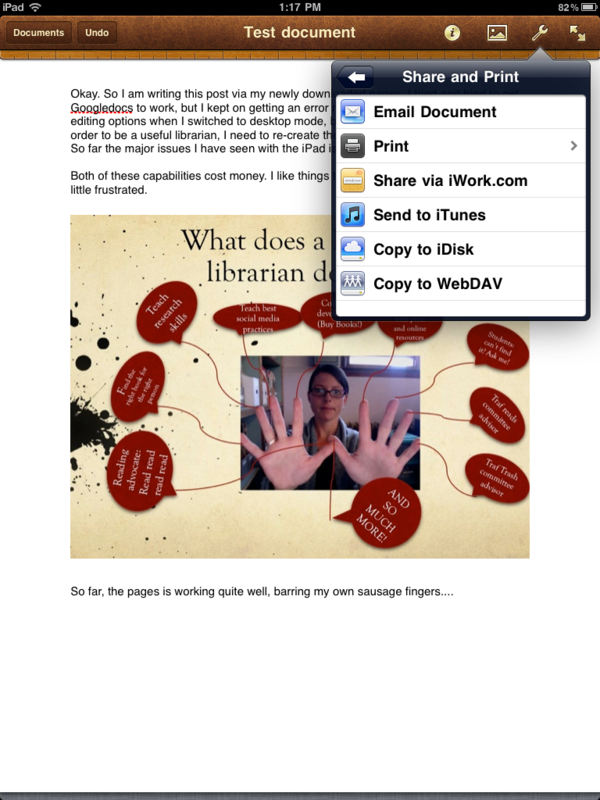 and yes, with the purchase of pages and the rest of the iwork suite, can be used as a word processing device. But, let us not forget: word processing is an AFTERTHOUGHT. I also want to be clear: Even though this is a tech blog, in that I am logging my adventure with the ipad here, I am in no way more technologically inclined than the next person(which would account for the difficulties of the last few days). Although I have a willingness to play with these new devices, it is considerably tempered by my need to have it work and work NOW. Alas, this was not the case with trying to print a document from Pages using my cheap-o print option Eprint. The print option given in Pages kept on saying “no printer detected.” And when I open the eprint App, it would not give me an option to open a document in Pages. 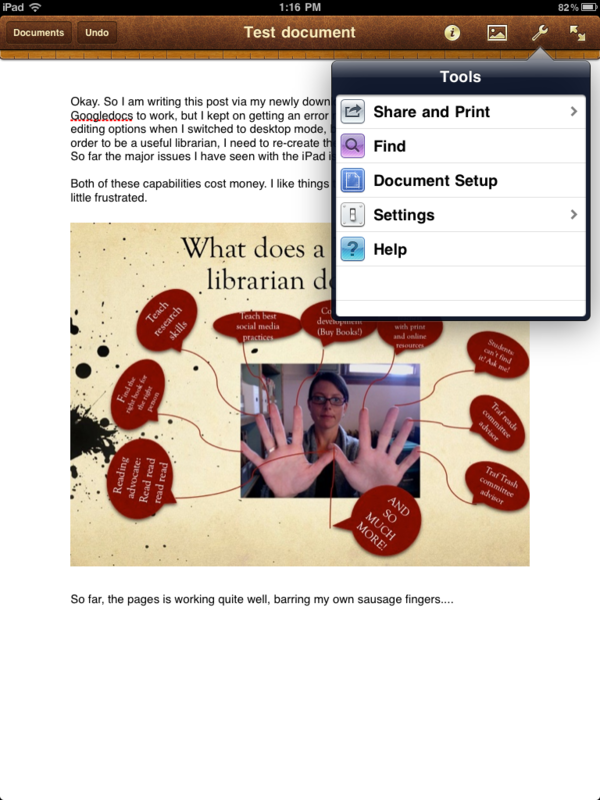 My goal was to find an easy way for students to create and share a document using their ipad. After researching the issue and finding nothing (nothing meaning many articles detailing how it wasn’t intuitive. Duh. Or how to connect an airport printer- which is also useless for the majority of people) I started playing around with it. 2. 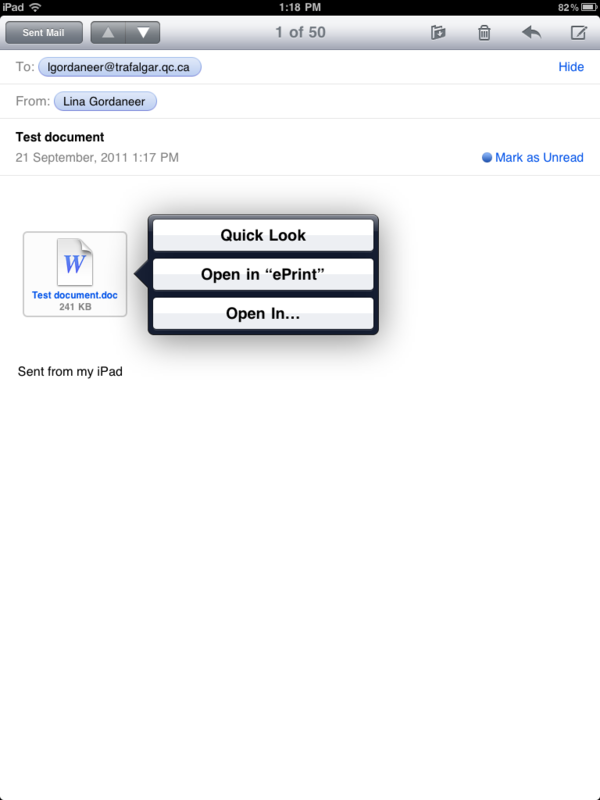 Email it to yourself and this is where I discovered that: DOCUMENTS IN YOUR INBOX CAN BE PRINTED WITH EPRINT! I seriously feel like a genius right now. 1. 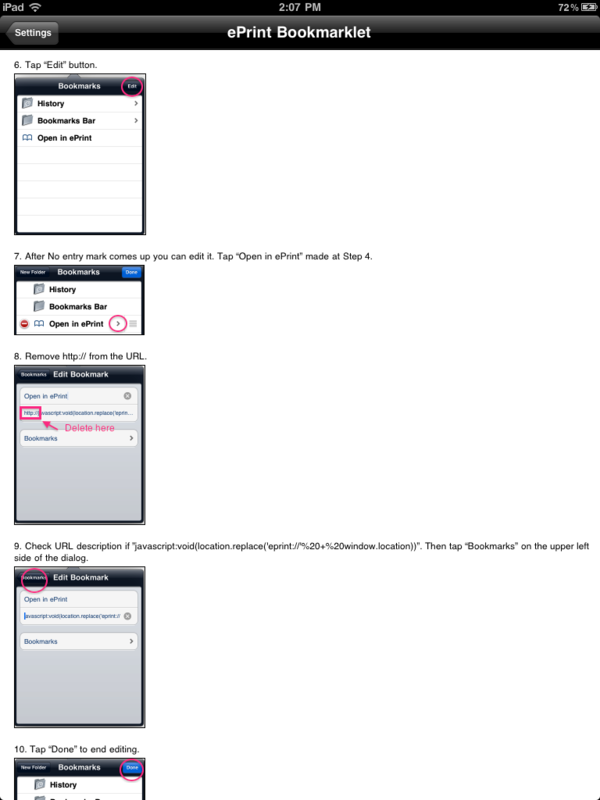 Create your document in Pages. NOTE: YOUR MAIL APP MUST BE CONFIGURED WITH YOUR EMAIL. 6. Open in eprint. 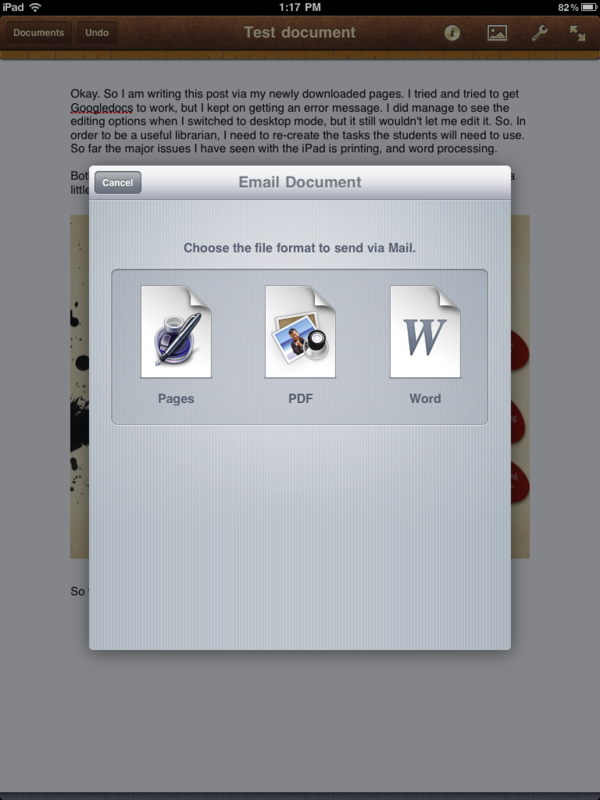 A message will appear saying you are trying to open a document from another application. Click OK and it disappears without any ill effect. Press print! Woohoo! Take that mister sync from itunes! (there is no actual mister- I am just assigning a gender to my ipad frustration-sexist, I know). Of course, syncing to your itunes is still a viable option for all those with more patience than myself, or those who start a document on their ipad and who want to finish it at home.